You've probably seen 'Radar speed display signs' or "your speed" signs many times. And you've probably also seen *yourself* slow down as soon as your speed was put up for the world to see. NUMEROUS studies have shown that in school zones and work zones these devices produce marked reductions in average traffic speeds. Studies demonstrated that these reductions continue even 2 years after permanent radar signs were deployed. Various types of speed display signs exist for a wide variety of different types of roads, and have been shown to effectively reduce speeds in many different settings. In fact the Maryland SHA's own study found speed display signs to be extremely effective in work zones, producing 2-7mph reductions in average speeds... nearly identical to the results they claim to have gotten from speed cameras. The SHA deploys radar speed display signs at workzones designated for speed camera use, but they are not uniformly deployed at other workzones. This indicates that it is possible that all or most of the reduction in speeds they reported at camera sites was in fact due to the 'Your Speed' signs rather than the cameras. 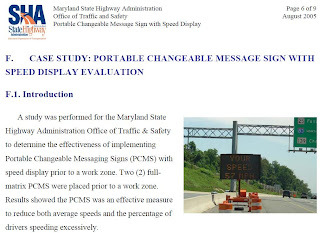 Another SHA study evaluated a similar device, a "Portable Changeable Message Signs with Speed Display" and found that "The average speed was reduced with the implementation of PCMS. After one week of placing the PCMS, the speed reductions ranged from 5.6 to 7.9 mph depending on time of day." Both studies were conducted in 2005, before the current administration began issuing $20million/year in speed camera citations and decided that the revenue producing solution was the ONLY solution. Solar-powered Radar speed display signs start at a few thousand dollars, but are eligible for grants under the 'safe routes to school program' which would potentially cover all or most of the costs of such a deployment in a school zone. So why aren't these used more? Well first off, they don't produce revenue. And unfortunately the attitude of many elected officials and some other is to look at ordinary people as "violators" rather than constituents, and as a result to view every "traffic engineering problem" as a "law enforcement problem". But given the relatively low cost and proven effectiveness of these devices, any school zone which justifies a speed camera certainly would justify one of these as well.. *for the children* not *for the money*. And one might also ask why so little if any of the revenue collected by local governments' speed cameras so far has been used for these devices, other than the fear that they would be "killing the golden goose" by introducing an effective alternative. 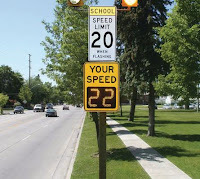 To be effective over the long term in school zones, radar speed display signs should be deployed permanently (don't let them get away with trying to make the claim 'oh well we tried' if they put one up for just a few days a few years ago as a ways to justify cameras instead). If they try to claim they've done 'everything' to reduce speeds in a newly designated school zone, go to the location and see if one of these is deployed right now. If not, no they have NOT tried everything already. Nobody can question that speed bumps slow traffic, and they are highly effective. In one study by the Institute of Transportation Engineers (ITE), the study found that after adding speed humps on a road with 25mph speed limits "85th-percentile speeds were reduced between 8 and 12 mph, or a decrease of 22 to 29 percent." Other studies found that humps reduced 85th percentile speeds by 14-42 percent. 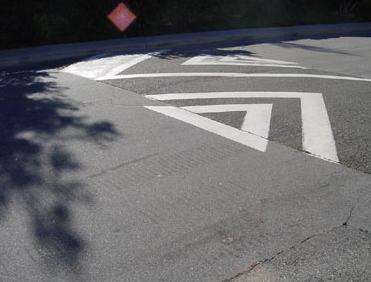 Newer designs use painted road markings to make the humps appear higher than they really are, amplifying the traffic calming effect. Unlike speed cameras, the effect is immediate, there is no 2-week lag for a motorist to get a ticket in the mail. ANY motorist, even a drunk or a criminal in a stolen vehicles, is forced to slow down, something which is not true at speed camera sites. Yes, some people hate speed bumps, and they are certainly not appropriate for ALL roads. But if a school zone or other circumstance justifies a particularly low speed limit, it's hard to argue that that speed humps would not be justified if speed camera (which degrade your right to face an accuser and your right to be presumed innocent) are. A similar traffic calming measure called "speed tables" can be used where somewhat higher traffic speeds are desirable, and are ideally suited for main roads through small communities. Tables are generally flat on top, and often have markings on either side to make them clearly visible to approaching traffic. They may be used in conjunction with crosswalks (referred to as 'raised crosswalks), to require traffic to slow down specifically at the location where pedestrians are crossing the road. A study by the ITE found that speed tables reduced traffic accidents by FORTY FIVE PERCENT on treated roads. The delay caused to emergency vehicles at such a site was "less than 3 seconds". In one example in Baltimore, motorists reported to StopBigBrotherMD a new camera site at 1100 North Howard Street (near West Preston and Park Ave) where numerous drivers were getting tickets for violating the 25mph speed limit. A search of the road in Google Street View did not turn up ANY speed limit signs ANYWHERE on that road. Recent photos showed the presence of brand new 25mph signs, which appeared almost exactly the same time as the cameras, but the same spot showed no signs at all in legacy Google Street View images. Nor did the legacy imagery show any "school zone signage", which only appeared around the time the first "school zone" camera was deployed. One motorist even checked their GPS, which reported the speed limit in that location to be 35mph. Frankly we've no idea whether the old speed limit was supposed to be 25 or 35. But at some point Baltimore will probably try to claim a dramatic reduction in speeding on that road since they added cameras, and hope nobody will be around to point out that it is completely bogus and not an 'apples to apples' comparison or credit the cameras when in fact the speed limit was either not posted or not adequately posted for a 25mph speed limit previously. Other Innovative solutions include the painting of special road lines in high pedestrian areas, such as these used in Hilo Hawai'i. Or these used in Bermuda. This was found in a Virginia DOT study to produce a long term mean traffic speed reduction of 7.5mph, with statistically significant speed reductions up to 500 feet away from the crosswalk markings. It was also shown to reduce the number of pedestrians crossing outside the crosswalk, another factor in pedestrian accidents. According to the Washington Post, the DOT was impressed by the fact that speed reductions were sustained over time: "Before the study, we thought the zigzag pavement markings would have an immediate impact on motorist awareness, but over time would lessen. It was interesting to see that the markings actually had a sustained positive impact on speed reduction even after the markings had been in place for one year." A wide variety of such traffic engineering solutions exist. They are inexpensive to implement... at least assuming that artificial cost in the form of the "red tape" is not thrown in the way of using them. All that is required is the political will to deploy a non-revenue generating but also non-Orwellian solution. NOBODY wants to be pulled over by a cop. Nothing has the psychological effect of being dressed down by a copy, then reminded of the incident with points on your license. In addition, stops by police take genuinely dangerous drivers such as drunk drivers or unlicensed drivers off the road, and have the added benefit in sometimes resulting in arrests solving much more serious crimes. And despite the occasional claim that this is not an optimal use of police time, that is simply not the case -- the PRESENCE of police cruisers out on the road DETERS other types of crime, and the officers can quickly be dispatched to crimes whenever necessary. Often jurisdictions claim that they cannot use more human enforcement because it is too expensive. And in fact from a certain perspective it's true -- in Maryland local governments are not permitted to keep the revenue (a fact specifically raised during the debates about some local speed camera programs). We would cynically argue that this actually validates the argument that speed cameras are really about money, and that local government were opting for a mechanism of enforcement which produced a guaranteed revenue stream. However recent changes have made such enforcement more cost effective, including the streamlining of the issuance of traffic citations by human police with 'e-ticket' systems, and a recently passed law which said that police do not need to appear in court for such citations unless specifically requested by someone contesting a citations. But if there is still a cost barrier for local police department there is a simple and fair solution -- change the state law to add an additional $25 or $30 to each speeding citation to be retained by local police departments to enable them to cover the cost of issuing speeding citations. Having tickets issued by a specific human police officer preserves a level of accountability in law enforcement which vanishes when the agency issuing the tickets knows they will never need to face the citizens they are citing. Keeping law enforcement out of the hands of the for-profit companies who spent so much lobbying to get statewide speed cameras to improve their bottom lines passed can prevent the sort of conflict of interest which has resulted in so many of the problems we have documented on this site. If law enforcement officers were really free to speak their minds instead of being required to support the policies they are directed to by their superiors then they'd agree with us. The first step in any speed enforcement program must be setting an appropriate speed limit. A publication by the ITE recommends the 85th percentile speed (the speed where 85% of cars are traveling that speed or slower) and a primary basis for setting speed limits on many roads. But the reality is MOST existing speed limits are arbitrary and were NOT set based on any traffic survey which determined what they should be set at. Obviously the 85th percentile is not the only measure which should be used, and in some cases lower speed limits around the 50th percentile may be in order. However we have seen cameras places in locations with speed limit at the 20th or 12th percentile (in one case newly lowered to that speed when cameras were approved). It is simply not the case that the large majority of motorists are reckless drivers, and (in our opinion) any elected official who thinks that should not be in office. Unfortunately prior to deploying speed cameras, many government agencies produce bogus traffic studies claiming speed cameras are NEEDED because X percent of motorists are exceeding the speed limit (and whether that number is 20% or 90%, they'll make the same claim that it shows such a need so long as the traffic volume indicates the cameras would be profitable). We'd argue if the study shows the MAJORITY of drivers are exceeding the speed limit, then the speed limit should first be evaluated, and if it is deemed appropriate by traffic engineers then traffic engineering measures should be applied. Not every traffic engineering problem is a law enforcement problem. We have unfortunately started to observe a tendency of local governments to LOWER speed limits where speed cameras are approved. In some cases (Brentwood, Mount Rainier, and College Park) new speed transition zones were created and a cameras placed near the (new) point where speed limits drop by 5 or 10mph. In another case (Cheverly), speed limits in a town were reduced by 5mph city-wide when cameras were reduced. During the discussion about adding cameras in Howard County, Mount Airy, and Sykesville, the prospect of lowering speed limits at newly designated school zones and camera sites was raised by local officials. It may come as a surprise to many motorists that speed limit decisions are typically NOT made by traffic engineers based on actual surveys and studies, but rather by politicians. 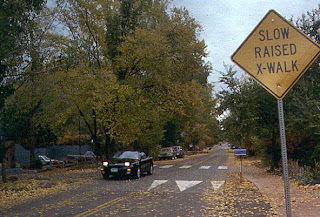 In a particular instance in Gaithersburg, the specific recommendation by SHA traffic engineers, based on an extensive traffic survey, that the speed limit at a highly lucrative speed camera site be raised was rejected by town officials, who responded by demanding that the SHA lower the speed limit in a nearby area where another camera was placed instead. The SHA's data included specific concerns that the camera was disrupting traffic patterns and not having a desirable effect on safety: "Observations of the camera’s impacts to traffic noted that motorists would brake significantly at each camera location, followed by accelerating immediately afterwards. This effect was most pronounced at the southbound camera, where motorists were observed frequently bunching together at the camera position. Given the recent installation of the cameras, quantifiable safety data is not yet available; but the current conditions may pose a more significant risk for rear-end and sideswipe conditions and, with speeds increasing immediately beyond the cameras, may not be achieving the desired safety benefits." 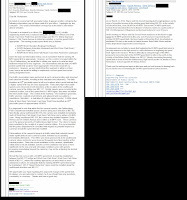 The city's response made it clear the decision originated from the mayor and council, not city or state traffic engineers: "At the meeting our Mayor and City Council were unanimous in the desire to not raise the 30 MPH speed limit in this area and, if fact, have requested that the existing 30 MPH speed limit, that now begins at Education Blvd., be extended an additional 750 feet, to the south, to Central Avenue." StopBigBrotherMD.org believes that our roads would be much safer if speed limits were set by traffic engineers based on traffic surveys and not by politicians seeking additional million-dollar-per-year camera sites. Our roads would be much safer if speed limits were set by traffic engineers based on traffic surveys and not by politicians seeking additional million-dollar-per-year camera sites. If speed limits are set rationally, you will only need to enforce the law for a handful of drivers. Lower them to the point where ordinary safe motorists feel like they are being used as ATM machines, and you will be inviting distrust between the people and the government and putting ordinary, honest, working people at odds with law enforcement.